Inspired by Rear Admiral June Ryan, a special guest at Cleveland Clinic’s 10th Annual Nursing Leadership Summit, Cleveland Clinic nurses have started sharing what they are grateful for at shift changes. 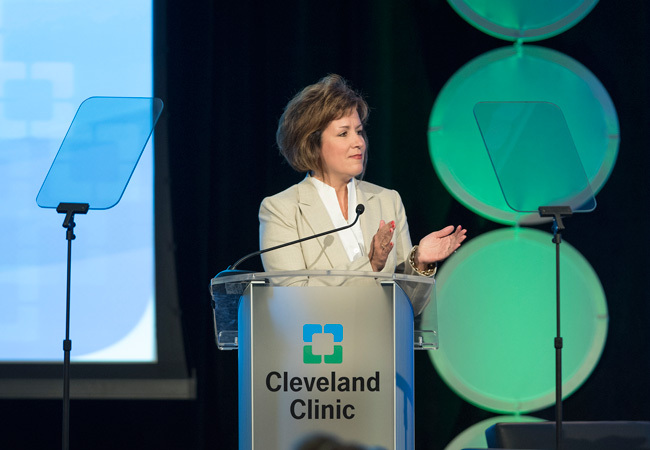 Inspired by a compelling and motivational presentation given by Rear Admiral June Ryan at Cleveland Clinic’s 10th Annual Nursing Leadership Summit, Cleveland Clinic nursing teams are incorporating a new activity into their daily huddles. At the start of every shift change, nurse leaders are encouraging nursing caregivers to share three things they are grateful for that day. The idea of this regular exercise is to create an environment where nursing caregivers can express appreciation for all facets of their lives, no matter how big or small. It also provides members of the caregiver team an opportunity to get a glimpse into the things that are important to their colleagues. The concept of having an ‘attitude of gratitude’ was first introduced to Cleveland Clinic’s 600+ nurse leaders at the Nursing Leadership Summit last year by Ryan, who is a motivational speaker, author, seminar leader and trainer. Retired from 35 years of military service, Ryan is a known trailblazer who achieved many historical firsts for women throughout her career, including the first enlisted woman in the Coast Guard to rise to the rank of Rear Admiral, the first woman to serve as Military Advisor to the Secretary of Homeland Security, and the third woman to serve as the Military Aide to the United States President. In her Summit remarks, Ryan commented that the daily ‘attitude of gratitude’ was something she and her colleagues practiced in the Coast Guard to further build team camaraderie. As explained by Ryan, gratitude has been described as a vehicle for prompting mindful awareness of others – enhancing personal connections through increased compassion and understanding and increasing one’s sense of belonging to a greater team. Increasing contentment and life satisfaction. Improving mood by enhancing feelings of optimism, joy, enthusiasm, etc. Enhancing sleep patterns and one’s ability to feel more rested after sleep. Encouraging ‘pay it forward’ behaviors and spreading helpfulness, generosity and compassion. Furthermore, other statistics show that expressing gratitude can also be an important tool in driving workplace productivity. In the context of the healthcare team, this can translate to improved team synergy, engagement, communication and decision-making, as well as enhanced performance – all of which can lead to better patient safety, outcomes and satisfaction.